Great for any beverage during the Diamond jubilee, these Queen Jubilee Plastic Tumblers are ideal for the 2012 main event with the celebration of Queen Elizabeth II's 60 year reign on the throne. 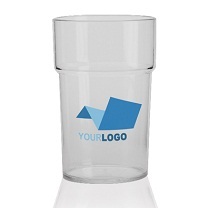 Hand out a great business gift to be remembered by, with a customised Company logo branding on these clear acrylic Queen Jubilee Plastic Tumblers, stackable and strong - ideal for cold beverages to share the joy in this momentous occasion. For a FREE QUOTE, please fill in the form regarding our Queen Jubilee Plastic Tumblers and we'll be able to help you.